Nexus Property Management™ provides clear cut costs right on the website and has no secret charges or unplanned fees. Our competitors do not publish their prices on their webpages or advertising. What does it say to you when the cost of doing business is a secret? Here at Nexus™ there is no mystery to what we charge, only a guarantee that each and every owner will receive identical, noteworthy treatment. Nexus Property Management™ is proud to offer a pricing schedule that is affordable and can accommodate any level of property ownership; from a single family to a group of apartment complexes. Our efficiency through technology allows us to do so while still preserving our paramount services. Unlike our competitors, we do not nickel and dime homeowners for items such as an “account setup fee”, “lease renewal fee”, or “administrative fee”. If your current manager needs to charge you to walk in the door then it is time for you to join the Nexus™ Family. If they affix fees for pressing “print” or stapling a few pages together then it is evident they do not deserve your business. Management fees: are based on a sliding scale determined by the rent amount for a single family residence, townhome, or condominium. 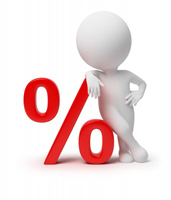 The management fees for 2 or more units are determined by the total number of units. 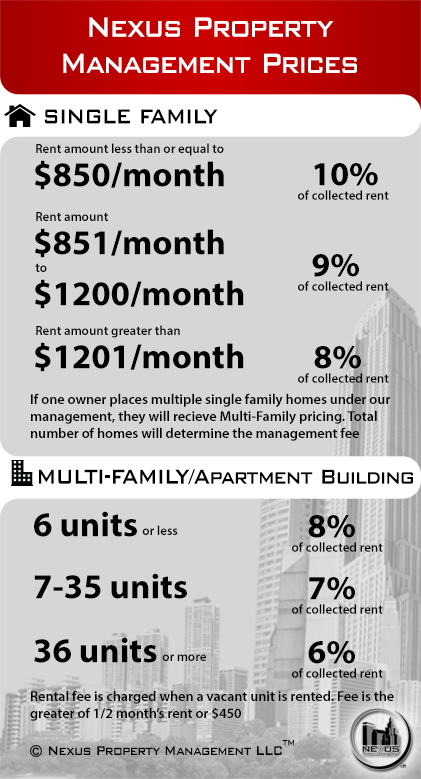 If one owner places multiple single family homes under our management they will receive multifamily pricing. Total number of homes will determine management fee. RErental Service: is 50% of 1st month’s rent or $450 whichever is greater. Once an OWNER approved tenant is placed. If a tenant we place for any reason leaves the unit in the first 90 days we will market your property and place a new tenant for free! Nexus Property Management™ only benefits when our clients benefit (tenant and owners alike!). We believe each and every client belongs to our team. Accordingly, our relationship is mutually beneficial when properties are performing exceptionally! If they are not up to speed, we will offer you the recommendation and services to get them back on track! Nexus Property Management™ will provide you the service to bring the cost of property management to ZERO, by raising income, improving equity, and giving you back the free time you want! Nexus Property Management™ Franchise. All rights reserved. Each office is independently owned and operated.